Workforce management is all about looking at a business through a critical, evidence-based lens. The goal is to put processes into place that maximize productivity and minimize wasted time, money, material and labor. The following are five of the most fundamental ways that workforce management can enhance your company. Training is the foundation of managing your workers effectively. All of the subsequent processes that you want to establish won’t work if you don’t teach every one of your employees how to play their part in the system. New workers can quickly become a drag on business if you don’t have a set, proven way of turning them from dumbfounded newbies into competent, productive employees in as little time as possible. The higher your turnover, the more critical the training stage. While every manager seeks to minimize employee churn, there are some industries and jobs that are simply less likely to attract people for the long haul. Dealing with turnover is one of the challenges of running a call center, for instance. Companies that excel are the ones that figure out how to make the best use out of the time that employees are willing to offer. It’s important that your employees arrive on time. But only if you actually have work for them to do. Workforce management is all about optimizing labor. You need to be constantly assessing what your employees do and whether their time working for you could be deployed more effectively. It’s critical that you don't overlook how management, including yourself, uses time. Those who are in the boardroom are just as likely to benefit from a review of how they spend their time and how they could operate more efficiently, whether that is cutting down on meetings or developing ways to get more out of meetings. Keeping consistent track of the time employees are at work or engaged in a certain project is key to understanding the productivity of your workforce. To that end, a reliable employee time tracking app can go a long way. With Timesheet Mobile’s GPS-enabled solution, you can compare the length of time one group of workers is spending on a project compared to another, leading you to discover best practices that you can implement company-wide. Having a centralized timekeeping system also allows you to more easily coordinate with supervisors at multiple sites. 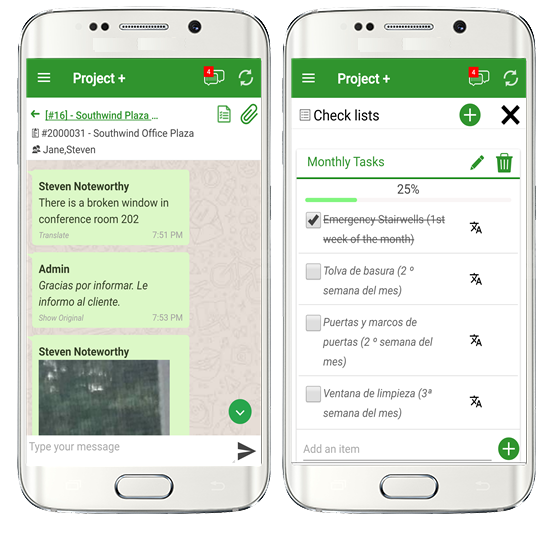 Such as with Timesheet Mobile’s Project+ feature, which allows you to share checklists with multiple colleagues that can edit or mark tasks as finished in real time. It’s also a convenient messaging system where you can communicate with large groups or send private messages. A holistic workforce management system can also be a budget lifesaver, particularly if you’re in charge of a large workforce of mobile employees operating at multiple sites. Being able to immediately see people's tasks, projects and schedules in real time can help you prevent incurring big overtime costs as well as help you to better-forecast the future costs of projects. The key to efficiency and productivity is not doing any more than you have to. That is particularly true if you have a large workforce of contract employees working on an on-call basis. The better you can forecast customer demand, the better you can schedule worker’s hours and delegate tasks. While nearly every business that experiences seasonal fluctuations will adjust their workforce accordingly, they often don’t do it with great precision. With targeted software, however, you can identify and analyze trends in your revenue and payroll that will allow you to staff with much greater confidence knowing every penny is being spent wisely. Fine-tuning your business to maintain or increase employee morale is not a precise activity, but there is plenty of evidence to suggest that certain management styles or workplace policies result in happier, more productive employees. What leads to low morale among workers? In a survey of 1,400 CFOs, the top response was lack of honest communication, followed by failure to recognize employee achievement, micromanaging, excessive workloads and fear of job loss. The challenge for you as a manager is that your goal of increasing employee morale may at times appear to conflict with your other business goals, such as maximizing productivity and efficiency. You don’t want to micro-manage or demand too much of your employees, but you also don’t want to allow employees to do things inefficiently or to waste time. It can be tricky to achieve that balance. The key to finding the happy medium is to communicate with workers as much as possible and learn as much as you can about how they feel about their day-to-day experience. You should also consider supplementing the regular face-to-face interactions with an occasional survey that gauges current employee sentiment and feedback. Anonymous surveys, as well as ones that identify the employee, can both serve important, distinct purposes. When they don’t have to submit their names, workers will be more likely to offer frank criticism of management that might be helpful for you to hear, yet if you know the respondents, you are able to more quickly address their specific issues. By analyzing employee responses to questions about a variety of workplace issues, you can decide what the biggest problems are that are affecting the most workers. For instance, if 10 employees with the same job all submit a survey and eight complain of not having enough work, while two complain about too much work, you know that the workload is either unevenly distributed or the two burnt out employees might need some additional training or assistance. What’s the point of crafting a killer workforce management plan if you don’t have workers who can be managed? That’s where recruiting comes in. The better you get at understanding the types of employees who will thrive, the less work you will have as a manager trying to make them as productive as possible. The science of hiring is ever-evolving and there are plenty of conflicting theories on best practices, but what most of them have in common is that simply employing people based on a gut feeling is not a recipe for success. As in other situations, the key is to assemble as much evidence for analysis as possible and be willing to challenge your most basic assumptions about what constitutes a good hire. One of the role models is Google, which for years has sought to identify characteristics that strong employees share. One of Google’s most compelling discoveries has been that having four hiring managers rate an applicant’s interview and then aggregating the scores produces a more consistent predictor of employee success than any one manager’s scores. The aggregation reduces the impact of the various irrational biases that might shape an individual’s view of an applicant. The other key part of talent management is preventing the departure of talent. Part of that is creating a satisfying work environment, but the other key component is compensation. To keep your best workers on board, you need to have a keen sense of what they’re worth and how much it would take for a competitor to lure them away. You (or your HR team if you have one) should regularly be analyzing any compensation data that is available for jobs in your industry, as well as periodically reviewing employee salaries to assess whether they are at risk of poaching.